Real Writing Interactive Update Edition offers practical coverage of paragraph-to-essay writing skills in a brief, interactive, and affordable format. The print component offers the essentials of Anker’s accessible writing instruction along with select exercises; additional exercises are available online in LaunchPad, including LearningCurve, adaptive, game-like quizzing that helps students focus on the material they most need help with. The e-book is also fully integrated within LaunchPad. 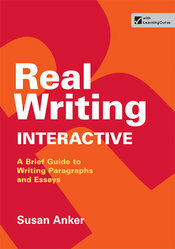 As with all books in the Anker series, Real Writing Interactive Update Edition motivates students with its message that writing is an essential and achievable skill and encourages students to connect what they learn with their own goals and with the needs and expectations of the larger world.